So let's talk tomatoes. Canned tomatoes. They are not all created equal. My preference for this recipe is using canned San Marzano tomatoes. These tomatoes are highly prized because of their true tomato flavor and sweetness. Finding them fresh isn't easy so I tend to use canned San Marzano tomatoes. They are readily available at local grocery stores and are perfect for this soup. I tried making the recipe with fresh roma tomatoes but the flavor wasn't always consistent. The disadvantage of using fresh roma tomatoes is that they don't always have the same flavor, depending on the season. But by using canned San Marzano tomatoes, you can be sure the flavor is consistent every time. 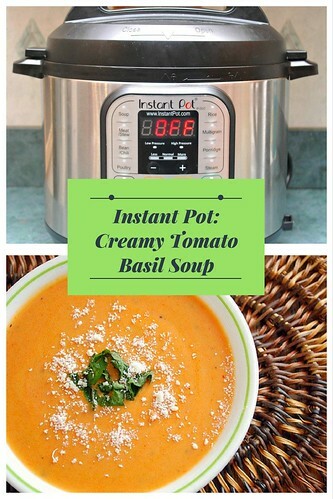 This isn't a soup where you want to start counting calories since heavy cream and butter is involved. Using low calorie or low fat substitutes won't give you the same result either. 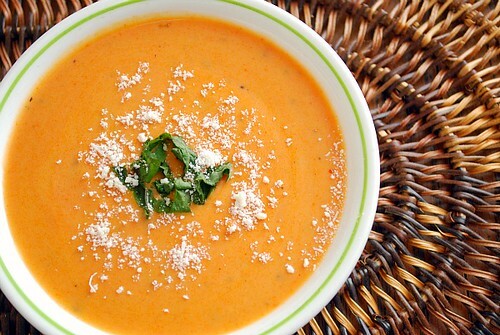 So if you want to make the soup, indulge a bit! Besides, everything in moderation, right? You can, however, make this with half & half and less butter if you prefer. Just know it will not be a luscious as it should be if doing so. Place undrained tomatoes and chicken broth or stock in IP. When the IP beeps after pressure cooking for 10 minutes, turn the setting on top of your IP to VENTING. Doing so allows the IP to quickly release any remaining pressure (also known as QPR or QR). I use a wooden spoon to carefully turn the setting to avoid close contact with the potential steam. You may also want to turn your IP away from cabinets to allow the released steam to escape freely. The pin at the top of your IP will drop when all pressure has been released and it's safe to open. 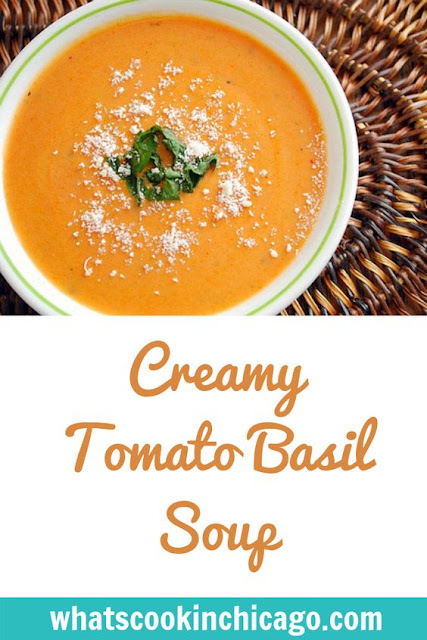 In the OFF setting, use a stick or immersion blender and puree the tomato mixture along with the basil leaves. Stir in the heavy cream or half & half, along with the butter. Season with salt and pepper to your preferences.To serve, garnish with chopped fresh basil leaves and a sprinkling of cheese.